This is generally due to a poor internet connection. For the best experience, avoid downloading other files or checking e-mail while taking a course, as other internet-related apps can interrupt the stream of data or cause an erratic experience. If the issue persists, contact your local system administrator or desktop support for further assistance. Resume an interrupted course or re-view a completed course by following the same process used to initially login to the learning management system (LMS). This issue can occur when Internet Explorer’s (IE’s) “Compatibility View” feature is enabled. "Compatibility View" is not supported. This feature forces modern, supported IE versions to use rendering engines from older, unsupported versions of IE and can result in functionality issues, visual degradation, and an overall poorer user experience on our products. If your issue persists, contact your local system administrator or support for further assistance with Compatibility View. As you click on the Policy/Code button in the course, the course gets pushed behind that window – don’t worry, it's still there. You can close or minimize the policy and the course should appear for you. Please do not launch the course again, as it's still active. Navigate back to the (minimized) course window and you'll be able to move on. The course has most likely timed out for security reasons. Please check your network configuration and try again. If you continue to experience connectivity issues, try to access the system via a hardwired (versus a wireless) connection. If the error message persists, clear your browser cache or reboot your system. Please click here to ensure that your Flash player is installed and is current. Unfortunately, an error like this relates to your internet connection, not the course itself. However, there are a few things you can try to resolve this issue. Usually by opening the training in a completely different browser (if you are using IE try switching to Firefox), you'll correct the problem. Please try opening the training in a completely different browser (if you're using Internet Explorer, for example, try Mozilla Firefox instead). If that doesn't work, or isn't an option, please clear your browser's cache. From the menu on the left-hand side select "Under the Hood"
Getting started in Learn I.O. If you’re receiving an error message at the top of the login screen, before resetting your password, please first ensure that the information you entered is correct. Be sure to type out your credentials in the required fields – copying and pasting can include hidden characters and/or spaces. If your company requires a VPN access to internal systems, then you must log in via your VPN provider in order to access the course. This may also happen if the True Office Learning domain isn’t whitelisted with your company, or because of another proxy issue. If this is the case, please contact your internal training administrator to get this issue resolved. This is because your course has expired. In order to extend the course expiration, please contact your internal training administrator so they may put in a request to extend the course. Pop-up blockers can prevent the course from beginning when you click the start button next to the course title on the main screen. In the toolbar, click More (three vertical dots), then "More Tools >", and select "Clear Browsing Data"
In the Clear browsing data box, select the tick boxes for "Cookies and other site data" and "Cached images and files"
On the top right click the Settings button for the options to expand (it's the three horizontal dots) and towards the bottom click on "View Advanced Settings"
At the top of the dropdown find "Block pop-ups" and click the toggle button to change the setting to "Off"
In the menu, select Tools, then click on Options at the bottom. Click on the Content tab and uncheck the box next to "Block pop-ups windows"
If you’re receiving an error message at the top of the login screen, before resetting your password, please first make sure that information you entered is correct. Please make sure to type out your credentials in the required fields, copying and pasting can include hidden characters and/or spaces. Go to poet.trueoffice.com to login to Poet. Your login credentials are included in the implementation documents. If you can’t locate these details or your implementation docs, please contact your TOL Relationship Manager or send an email to service@trueoffice.com for help. Please note that Internet Explorer is not supported. 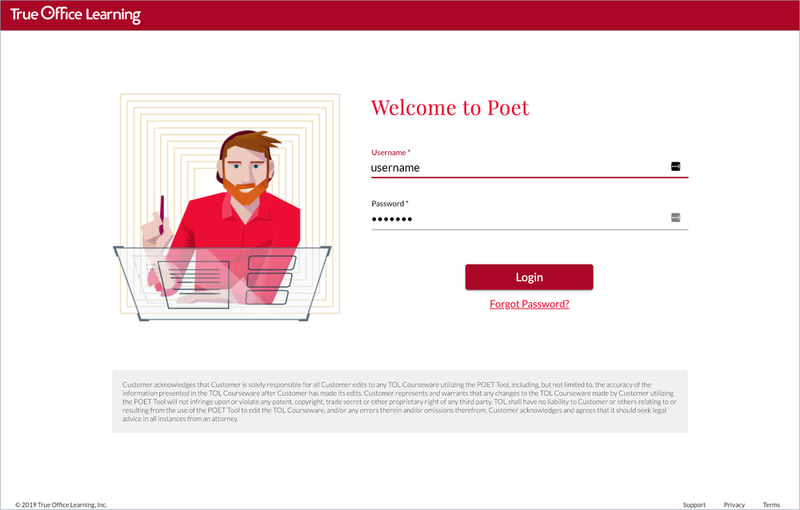 Please note that Poet only supports Scholar courses that your organization has published, or those created by your team in the Poet tool itself. At this time, Poet does not support time-limited Scholar courses, like those created to honor sexual harassment regulations in the states of California (CASH courses) or Maine. Need more help with Poet? To learn about every feature of Poet Editing/Authoring and full walkthroughs, check out the Poet Access Guide. Just click the 'Support' link (under the Account button in the Poet header) to view the guide. Go to analytics.trueoffice.com to login to I.Q. Your credentials are included in the implementation documents. If you can’t locate these details or your implementation docs, please contact your TOL Relationship Manager or send an email to service@trueoffice.com for help. If you’ve forgotten your password, request a new one by clicking the Forgot password link on the I.Q. login screen. Ensure you have access to the email account associated with your credentials, then follow the onscreen prompts, and subsequent email. Please note that I.Q. only works for Scholar courses that your organization has published, and which launched after July 2014. If a course fits this description and doesn’t appear on the Course Selection page, contact our Support Team. Need more help with I.Q.? To learn about every feature of the I.Q. Portal and for full walkthroughs, check out the I.Q. Access Guide. Just Click the "Support" link (under the Account button in the I.Q. header) to view the guide. If you forgot your password and need to reset it, click the "Forgot Your Password" link and follow the prompts. Once logged in, your Dashboard will appear. Find a video by entering a keyword in the Search Bar at the top of the screen, or browsing the Categories link to the right. Hover over any video title to see a summary. Click the Download button directly below the video thumbnail. Above the video thumbnail, click on Asset Details. In the dropdown, click on Shares. For the video title you'd like to download, click on the Order Number at left, or View Order at right. On the subsequent screen, click on Download below the thumbnail (not "Download All"). Email the video to your team! If using a link – select Video With Player from the dropdown, copy the link that appears, and distribute to your employees as you would any other web link. If using an embed – select Video With Player from the dropdown, then copy/paste the code into an appropriate page on your company intranet. To drive traffic to the video, distribute a link to the specific intranet page where you embedded the code. You may want to Contact your IT or Video department and have them create a set of internal web pages, each displaying a different video. These pages can then be kept private and be distributed or integrated with other platforms as needed, by linking to that internal web page. Don't see a video for a particular topic? Haven't found what you're looking for? Let us know. *Course and LMS issues can occur when Internet Explorer’s “Compatibility View” feature is enabled. "Compatibility View" is not supported. This feature forces modern, supported Internet Explorer versions to use the rendering engines found in older, unsupported versions of Internet Explorer. This can result in functionality issues, visual degradation, and overall a poor user experience on our products. **Latest version, plus one version previous, are supported.